Senokot is a laxative made with natural senna treated especially to yield a constant amount of active ingredient in each dose, to give predictable relief from occasional or non-persistent constipation. The small, easy to swallow tablets provide gentle and effective relief in 8-12 hours. Treats occasional or non-persistent constipation. The senna plant has been used as a laxative for many years. Provides relief in 8-12 hours. The active ingredient in Senokot is the extract of the senna plant. The senna plant has been used as a laxative for many years, and has proven to be safe. The bowel works by pushing stools down using a wave-like motion known as peristalsis. The senna in Senokot gently stimulates the bowel, thus pushing stools down faster. This is a reliable way of relieving constipation. Take 2 Senokot tablets before bedtime. Suitable for adults and children over 12 years. Senokot's natural senna formulation will provide gentle relief in 8-12 hours. Always read the leaflet and labels. Do not take if allergic to any of the ingredients. 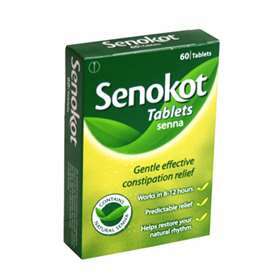 As with all laxatives, Senokot should not be used constantly in the long term. Constipation may be symptomatic of a deeper underlying condition. Diarrhoea is a sign of over dosage. As a responsible pharmacy, Express Chemist are required to restrict the sale of laxatives. For this reason, we are only able to ship one Senokot 60 box at a time. Multiple orders will not be accepted. If you suffer from long-term constipation, you may like to visit our constipation page. For example, augmenting your diet with fibre will help constipation in the long term, with Senokot for use during more severe episodes.